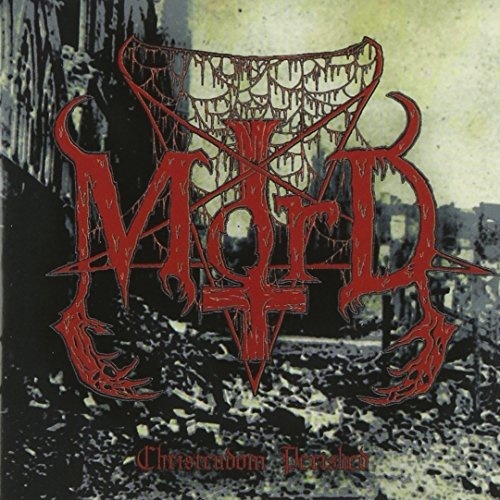 A sonic blasphemy in nine movements, Mord's optimistically named Christendom Perished album builds upon the premise set down by a series of similarly impertinent demos, filled with satanic posturing and hateful vibes (the band's name means "murder" in Norwegian') to go with the frenetic black metal barrage conjured up by the blood-drenched, undead duo. Ever-present blastbeats, vomited vocals, and buzzsaw riffing (plus, what sounds like a real buzzsaw in tracks two and three!) dominate the violent proceedings, most of which are clearly inspired by the seminal work of Darkthrone, Marduk, and Impaled Nazarene, minus the latter's dark humor and goat references. Oh, well. Instead, Mord's competent but rather uniform and derivative style combines with utterly indecipherable lyrics to make their choice of Roman numerals over actual song titles feel both frustrating and all the more unimaginative. Cheap-thrill seeking metalheads may therefore find themselves content with the music's intensity and forgive its arcane qualities, but anyone looking for an actual game plan to the band's anti-Christian mission will be left wanting. And without any clearer clues of these suggested, grander designs, Mord's first effort winds up cloaked in just little too much smoke and mirrors to inspire greater devotion.